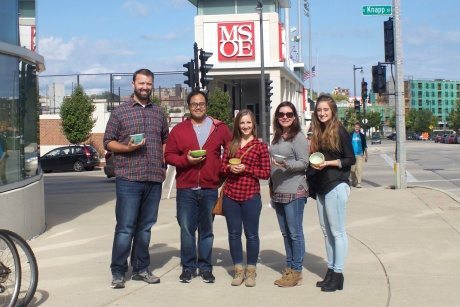 For the past 18 years, the city of Milwaukee has been holding a charity event called Milwaukee Empty Bowls; an all-volunteer, non-profit organization with a goal of raising hunger awareness. All of the proceeds go to help fund food pantries and meal programs throughout Milwaukee. This month, members of the Top Floor team participated in the event. The event was held on a beautiful fall Sunday afternoon at MSOE (Milwaukee School of Engineering). When we arrived, we entered into a large room filled with multiple tables full of over 2,700 one-of-a-kind handmade bowls that had been donated by local artists and schools throughout the area. Each bowl included a card that told us what school or business it came from. There were a variety of colors, designs and shapes to choose from. In addition, there were over 250 colorful and expressive kid’s bowls as well, made by elementary school children. We walked around, scoped them all out and choose our favorites. As we perused, there was even an artist doing a demo on how to make a bowl on a pottery wheel right there in front of us! The next step was to get our bowls paid for and washed up. The purchase of a $25 bowl came with 2 soup tickets. When we then entered the cafeteria, it was packed with tables to sit at, and soup stations from over 33 local restaurants in the area; Beans & Barley, Comet Cafe, Hue Vietnamese, and Zak’s Cafe, just to name a few. We walked around, enjoying our soup and listened to live music, like the Fellowship of Stings, an ensemble from Wauwatosa. At the end of the event, we got to keep our bowl as a memory of the contribution Top Floor made to help fight hunger. 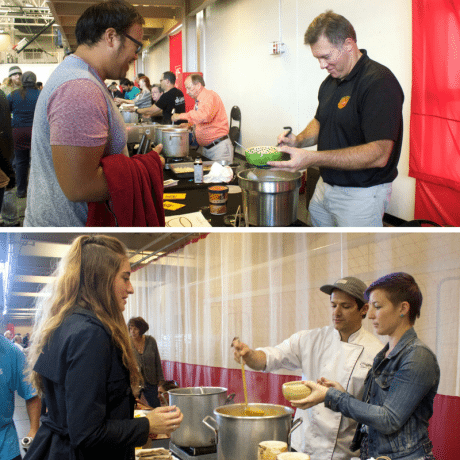 Milwaukee Empty Bowls is an awesome, fun and creative event, which Top Floor was proud to be a part of this year. The event as a whole raised over $66,000 and 7 recipient organizations will now benefit from the funds; Central City Churches, The Gathering, Fondy Food Center, Milwaukee Christian Center, Milwaukee Rescue Mission, Repairers of the Breach and Tippecanoe Church. If you want to learn more, visit http://www.milwaukeeemptybowls.org/.